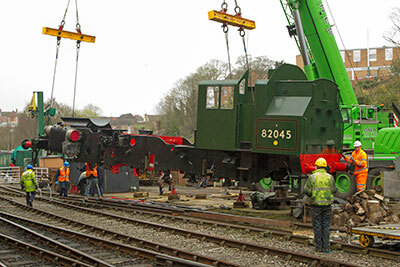 The cab roof has now been replaced as have the damper controls, driver’s pedestal and temporary cab floor. All these items had had to be removed in order to gain access to the lifting points on the main frame for the big lift on 17th. April. 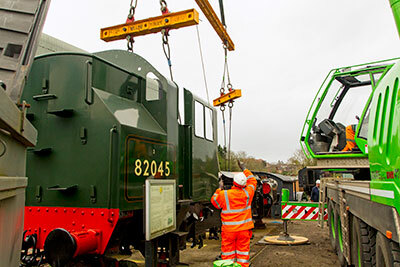 The smokebox was also removed at the other end and will shortly be replaced. Preparations are in progress for fitting the springs. We have enquiries in progress for the manufacture of the brake rigging. We are also looking into the manufacture of a firebox foundation ring, longitudinal stays, transverse stays and palm stays in order to have these items to hand for when the boiler/firebox construction starts. Cladding covers for the cylinder and steam chest end covers are in the course of manufacture. Well, it looks as if I've got my work well and truly cut out for the next couple of years, and just when I'd thought my job was more or less done. As reported in last month's notes, the tempo of the project has been accelerated and approximately £200,000 now needs to be raised over and above what established income streams will bring in. I asked last month if anyone had any suggestions for raising cash and have received some interesting ideas which 82045's publicity/fundraising sub-group will be discussing at its first meeting on 8th June. I'm firmly of the belief that several heads are better than one and look forward to working with the new group, all of whom are drawn from the existing working team. Please wish us luck - and don't forget to keep on sending in your ideas! If anyone feels that (s)he would like to take on any of the above, please get in touch with Chris. 82045 on the main line: what do YOU think? This is a subject that has been buzzing around in a number of heads (mine included) for the past couple of years; others are less enthusiastic. While it is difficult to make a convincing economic case for equipping a Class 3 tank engine carrying 1500 gallons of water and less than four tons of coal so that it can venture out into the big wide world, the axiom "Never say never!" is hard to argue with. It would be plain daft to envisage 82045 being flogged along an arterial rail route, but the idea of occasional short-haul runs is not too fantastic. One idea that comes to mind might be Birmingham Moor Street to Kidderminster and Bridgnorth, and no doubt those of you who don't think the notion entirely ridiculous will have your own favourites. What about banking a Bulleid Pacific out of Waterloo, for instance, or even resurrecting the "Kenny Belle", the last steam-worked local passenger train on the SR and a regular turn for one of Nine Elms's 82XXX tanks towards the end of steam? Or even piloting a WR Manor up Talerddig Bank if it should prove possible to get around ERTMS? Main line certification is costly but would open up all sorts of possibilities without detracting from the stated fact that 82045 is - and always has been - intended for use on heritage (I really don't like that word) lines. These engines regularly loaded to seven coaches over the Cambrian during the holiday season and handled them with perfect competence, so a main line run is not out of the question. The thing is that, if we are going to proceed in this direction, the decision needs to be taken soon, certainly before the boiler is fitted (certification is a boiler-out job). I am not in the least dogmatic about this matter, but I would like to explore the general feeling before it is laid to rest and I think that all of you who have put money into 82045 should have the right to say "yes" or "no". Please let me know your feelings: disagreeing is completely acceptable; rudeness (we had lots of that in the early days!) is not, and the majority opinion will be respected. Your answers please to Chris (chris.proudfoot045@btinternet.com) by 31st July. 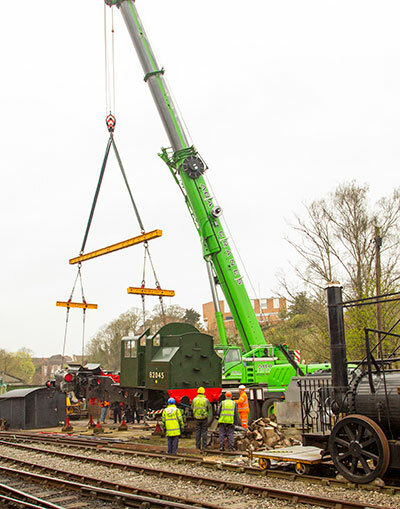 Some further photos of last months big lift on to the wheels. Photos: Nige Nicholas.